Brilliant dancer Aditi Mangaldas turns down the National Sangeet Natak Akademi award in the category of Creative and Experimental Dance. Reproduced below are some relevant correspondences on the matter. After much introspection, I have regretfully declined the Sangeet Natak Akademi award 2012 given to me for my contribution in the field of Creative and Experimental Dance. I feel that the category in which I have been selected is incorrect. I have the highest regard for this august institution and hence it pains me even more to decline this award. All my work has been in the field of Kathak, 80% of which is in the classical idiom and 20% is contemporary work, which is also strictly rooted in Kathak. Over the years, I have persevered towards preserving, making it relevant, letting it harmoniously and homogeneously evolve, helping the stream of Kathak to expand and be ever rejuvenating and full of energy and life. This is perhaps the right moment to introspect about what exactly is meant by ‘Kathak.’ Recently, the Kathak Kendra, the National Institute of Kathak Dance and a constituent unit of the Sangeet Natak Akademi, held a festival in which a young dancer was made to change her publicity material as her photograph portrayed her without a dupatta. The letter issued to her, stressed that she abide by a certain form of "Vesh - bhusha". We need to beware of such authoritarian decrees. Wearing of a dupatta is not an essential hallmark of Kathak but a question of aesthetics, relevance and context, which the artists themselves must have the prerogative to choose. We need to distinguish between what is extraneous and what is quintessential to the art form. I am sure the Sangeet Natak Akademi will debate upon this seriously and I do hope that a constructive dialogue can begin on this issue. 1. You wrote without full information of the matter. 2. Kathak Kendra never asked anybody what to wear or not. 3. As senior dancers we say that Kathak dance has a classical dress code like all other dance forms. That is the first identity of any classical form - like Bharatanatyam or Odissi or Kathakali. You identify any dance form through the costume first and that is the essential part of it, classically called “Aaharya”. 4. You referred to a recent “Kathak Utsava” which was held in Varanasi from 27th to 29th December 2012. This festival was meant for younger generations of Kathak dancers. Kathak Kendra is an institution to teach the tradition of the age old Kathak form and costume also is a part of it, which all the students have to learn. Without knowing the tradition one can’t go for the experiments and that’s how the identity develops. 5. Last but not the least we feel surprised that you want yourself to be considered in the category of Kathak awardees but on the other hand you are refusing the basic traditional attire of it. We think that we should not confuse the younger generation. We wish you well for your future endeavors. I have decided not to address you personally but to the institution as a whole. I have great regard and admiration for your contribution to the field of Kathak, so please don’t take this personally. I would like to clarify that I never asked to be awarded in the first place in any category. I simply declined an award that I thought does not correctly represent my life’s work. This episode has opened up greater and substantial issues that as a Kathak dancer I feel need to be debated upon with an open and constructive attitude. I have spent many amazing and inspiring years at the Kathak Kendra. Those years are part of my training and have given me the energy to persevere in my work. However, national institutions have a very responsible role to play and need to be inclusive of all the Kathak streams that are vibrant and active. When you say traditional, what does one mean? How far back in history do we go? The structure of the Kathak ang, musical accompanying instruments, literature, ambience, presentation, costumes have all undergone constant evolution and refinement. Kathak has developed and grown, adapted, changed with a change in context to the community or the ambience. It has been enhanced by the relentless inputs of great artists and dancers. Each dancer, albeit from different gharaanas, has constantly expanded the vocabulary of Kathak, “Aaharya” being an integral part of this change. Would you not agree that there is no absolute in what we call traditional? But in fact an evolution in which many factors play a part. Additions, for instance the introduction of the Tarana, intricacies in rhythmic permutations, new musical instruments including the tabla, stitched garments, non-mythological literature were also incorporated and transformed while keeping the broader sensibility and spirit of the form. We need to recognize the multiplicity in classical arts. They are not and have never been uni-dimensional. Like a river, tradition needs to rejuvenate itself and flow. Preservation can only happen by a constant input of evolution. We don’t need to be afraid of change but be observant. Change is the only constant in life. Kathak today is an amalgamation of multitude of tributaries that has fed it over the centuries. To reinforce it, maybe we need to make sure that this gushing water is always rejuvenated by fresh input from today’s performers. Only the substantial will remain, all else will fall away like dead skin. It is good that we are all passionately discussing this and I thank you and also all the others who have responded and spent time and effort on this very important debate. Please refer to your letter below, I have answered under each point (ANS). ANS: Do let me know what the information was that I was missing. ANS: If your reference is about the mention of a dupatta, Kathak Kendra did call that young dancer and specified that her photo was without a dupatta and that she should change it and send a ‘Kathak’ photograph. ANS: As a senior dancer, I believe the “Aaharya” of Kathak is and has always been flexible while it has maintained the overall sensibility of the style. It has evolved over the centuries keeping in mind the aesthetics, the community and the ambience which has then been adapted by different practitioners from around India. Sitara-ji, Kumudini-ji , Rohini-ji, Roshan Kumari-ji, Damayanti-ji all had different styles of “Aaharya”, which they adapted in their own context just as many of today’s dancers feel the need to do and yet they were all, and are all part of the larger Kathak world. I have learnt many interesting things with regard to “Aaharya” during this short debate, for example how the Bharatanatyam costume has evolved. Hence this evolution of classical attire is not only subject to Kathak. 4. You referred a recent “Kathak Utsava” which held in Varanasi from 27th to 29th December 2012. This festival was meant for younger generations of Kathak dancers. Kathak Kendra is an institution to teach the tradition of the age old Kathak form and costume also is a part of it, which all the students have to learn. Without knowing the tradition one can’t go for the experiments and that’s how the identity develops. ANS: Yes, without having strong roots one cannot grow. It’s great that you are giving young dancers an opportunity to perform and teach them about costumes of this age old art. Would you agree that it is necessary also to educate them about the various ways the Kathak costume developed and evolved, changing with times and ambience. Unfortunately your letter to the young dancer did not reflect this in my opinion. ANS: Please don’t be surprised. I am a Kathak dancer and have had the privilege of being a student of two of India’s greatest Gurus, Smt. Kumudini Lakhia and Pt. Birju Maharaj. When I dance Kathak, which forms 80% of my work, the “Aaharya” is very well within the recognizable Kathak dress code. Evolved, enhanced and much improved in my opinion! What is basic traditional attire is the debate! And who decides that? I may not agree to your definition of what basic traditional attire is and you may not agree to mine, but that does not make you or me any less of a Kathak dancer. 20% of my work is “contemporary dance based on Kathak.” Here I am trying to restructure the very aang of Kathak itself, so of course the “Aaharya” has been restructured too. However, every time we perform this, I have always classified it as “Contemporary dance based on Kathak.” And so the question of confusing young students does not arise. I never stated to be considered in the Kathak category as I never stated in the first place to be a recipient of any award. One of my contentions for declining the award was that had I accepted it, it would have perhaps confused the students. Students hopefully will look at the entire growth of Kathak, the various tributaries that have fed it through the centuries and the dancers of today who are feeding it to make it the amazing style that it is. ANS: Thank you and I wish you the same. I think this is an interesting situation not only because of the emotions involved but because of the sheer confusion in definition and classification. In science, the definitions are precise and objective and in art it seems to be subjective. Who can define "what is exactly Bharatanatyam?" or "what is exactly Kathak?" but every one understands Bharatanatyam and Kathak when they see it. This is akin to defining the term "quality", ever so brilliantly argued by Richard Pirsig in his famous book, "Zen and the Art of Motorcycle Maintenance". Recognizing a particular form depends on the cultural analogues built-up in the minds of the observers over the years by tagging movements, costumes etc. to a particular form. So when a thinking artiste pushes the envelope by novel costumes or movements, it is not immediately recognized. Why? Because the sustenance of the innovation is time dependent. My basic question is "why define?" If a cultural body wants to honor an artiste, why doesn't it just honor her for what she does - rasotpatti which is the ultimate goal of an artiste. I am shocked at the comment both by Ms Shubha Mudgal and by honorable chairperson of the Sangeet Natak Akademi on the Dupatta issue and their comment (a) that the management of the Kendra is like a khap panchayat (b) that a person representing the apex public body on performing arts comes out on facebook and says teachers, not the word gurus, and others need to be punished. The period of cultural revivalism of Indian as part of the National movement starting from the 1930s, even Kathak had all through the latter half of 20th c some illustrious scholars who voiced in depth opinion and interpretation on the grammatical dynamics and visual anthropology of the dance. Of the well known voices of scholars only two are still alive Dr. Kapila Vatsyayan and Dr. S.K. Saxena. While pursuing my studies it was brought out that the dupatta even according to Pandit Birju Maharaj-ji is an essential aspect to bring out the two dimensional flow of the Kathak movement and to create a sort of lyricism. The dupatta was adopted not only for women but also as part of the male costume. The presence of dupattas in the costume of the famous painting of dancers from Mandu in the Akbarnama, or even in Turikic manuscripts in the Patna Museum and the Rampur Raza Library or even Dr. Vatsyayan's book on Dance in Painting are historical evidence for the dupatta as an essential visual vocabulary of the dance. If Guru Kumudini Lakhia removed the dupatta in 1973 from some of her choreography it was for a technical reason to highlight the inner dynamics of the dance vocabulary and not as a fashion statement. How can Ms Aditi Mangaldas first of all imply that it was because of the dupatta that she was denied the mainstream Kathak reward? How trivial and how derogatory to the entire selection committee of the Akademi, of which I am sure the chairperson is a prominent member? Yes, in Kathak too, there remain people who will defend the tradition, and will fight for its dignity just as I am sure there are people in other traditional classical dance form canvas who make sure rules of the basic form including visual communication of the form is strictly followed. This is not getting tradition stalled but is preserving the basic visual format of the dance. It is extremely wrong of Ms Mangaldas to politicize the issue and for cultural icons and cultural administrators to pass remarks with such callousness. Secondly, the building of the Kathak Kendra in Chanakyapuri is ready, and the present center is a Security risk for women who teach, work and learn there. Both the hostel and the classes need to be relocated as soon as possible without any further delay along with ferry buses. No kind of debates are necessary and further excuses for delay is completely unacceptable. The chairperson who unfortunately suggested to me that teachers and not gurus such as me should take in students of the kendra in our houses or they can shift into another colony is completely appalling. We are not running tuition centers and are not teachers; at least the chairperson must address the transmitters of the Kathak tradition as gurus. What kind of careless comment to make for a person heading the apex public institution for performing arts? I hope this email is taken up as a good potential story by media people to whom I am copying as a responsible citizen to raise a debate on state of arts in a vibrant democracy. Has the dupatta become a noose? I have been following the debates posted on Narthaki and elsewhere surrounding Aditi Mangaldas, dupatta, tradition, authenticity, and modernity. Permit me to say a few words on the subject. First, this is absurd. How ridiculous it is that we (the educated, urban, middle and upper-middle classes in India) are having this conversation about dupatta in the twenty-first century...a topic more suitable for the khap panchayats. Second, this is historically and materially wrong. Who says that the dupatta is a necessary element in Kathak? Esteemed gurus, choreographers, and performers of the dance have contributed significantly to its oeuvre minus the dupatta. We need look no further than the work of Kumudini Lakhia, who, as we know, modernized Kathak four decades ago (ingeniously so, without recourse to some other dance style or vocabulary) and inspired a whole new generation of fabulous artists like Aditi Mangaldas and others. Third, knowledge, seriousness and self-awareness do not seem to have a place in this discourse. These questions on tradition and modernity have been debated and more or less put to rest in the academy. We have read historian Eric Hobsbawm’s "Invention of Tradition" as well as Partha Chatterjee, Asish Nandy, and many post-colonial and feminist theorists on the subject. I have personally written about the construction of the category called "classical", the gharana, the patriarchal construction of lineage and the marginalization of the tawaif/courtesan in history. There are many scholars who have written extensively on the history of Kathak (look up Margaret Walker, Mekhala Natavar, Peter Manuel, Joan Erdman, Sarah Morelli, Veena Oldenburg, Pran Nevile etc). If we have any sense of Indian history and the history of Kathak within it, we know that what some accept as the “traditional” Kathak costume is a modern invention of a Hinduized Kathak. A quick look at miniature paintings and photographs from the past will reveal the wide range of costumes, hairstyles, jewelry that were in vogue and how they have changed. 1. Is it possible to be a liberal, progressive secularist and a socially-aware human being and still embrace Kathak today? 2. How do we engage the youth today and make them interested in the classical arts. The youth in India are a force to reckon with; they are asking bold questions and seeking new identities. As we witness the restructuring of the old order we need to think seriously about how we can make the classical arts such as Kathak relevant to the new generation. This is an old question: it was taken up by nationalists, artists and intellectuals during the nationalist movement. That is what led to the creation of what we now call the classical Indian. But how do we reclaim the classical as part of contemporary culture? In our moment of change, how do we craft new opportunities, encourage experimentation and new thinking? 3. How do we reclaim Kathak from its patrilineal oligarchy and ideological mindset of a feudal past? In many quarters, intellectual debates regarding the classical arts are dismissed as elitist, upper caste, and owned by only a handful. But the truth of the matter on the ground is that Kathak today is largely practiced by people who are not from the privileged classes. This is as it should be. In the twenty first century Kathak should belong to everyone regardless of their lineage, race, class/caste or gender. But how do we release Kathak from a culture of sycophancy and cronyism that stems from a deeply embedded patriarchal narrative of guru-shishya parampara? How do we stop the dupatta from being a noose around Kathak’s neck? I want to thank Aditi Mangaldas for starting this much needed dialogue in Kathak. movements evolve from the panjar of the spinal cord. Much like principles of painting, it is two dimensional tradition, the entire expression unlike Bharatanatyam, Orissi, Manipuri which is three dimensional. This is what makes it inspirational for masters like Raza Sahab to be inspired by Kathak. We have all heard my guru Birju Maharaj speak about shoonyata and bindu, we have all heard this intuitive guru express himself in terms of lines and flows. The dupatta is part of the flow of the lines. It remains an important aspect of the visual grammar of Kathak both for women and for men. I correct Smriti Mishra that Maharaj-ji never rejected the dupatta and if ever did not use it, he always had a technical justification and not to make a fashion statement. Simple but most intricate are his compositions carrying with them a strong comprehension of the inner rules of grammar of Kathak vocabulary. Shubha-ji is a great musician, Aditi a good dancer, Smriti Mishra a good artist (all are active on facebook) but not one of them has justified (a) rejection of dupatta as Kumudini-ji has on technical basis in formal performance. 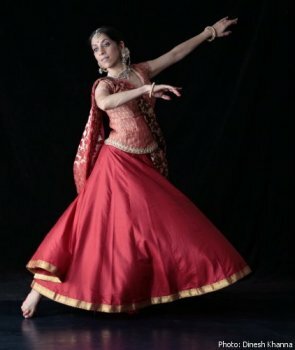 (b) To say that Aditi has not got the award for mainstream Kathak is an insult to the Sangeet Akademi Award Committee under the leadership of honorable Chairperson Leela Samson. She still got a national recognition (which is not a joke) for her experimental creativity and as a parallel stream of and under the Kathak category, so what is the problem? Yes, taking this line of argument, the comments of Smriti are flippant. Let her or any other person justify their comment from either a historical or a technical perspective, after all is Aditi not trying to prove a technical point? An intellectual in depth debate is always healthy. The great tradition of Kathak is like a great river, but also has its boundaries and internal grammatical rule, it has flowed through centuries and survived political upheavals of North India precisely because of its inner soul and anchor which its practitioners needed to respect while improvising. Congrats, Anita Ratnam, for the awareness you have given this national academy bestowing awards. I am sure SNA must arise from darkness with Leela Samson as the leader. This has happened to Karnataka dancers also, wrong category, wrong dancers, and dancers serving as professionals all their life are ignored. The concerned people in department of culture and government of India should take action on the selection committee; they are not eligible personalities. Committee should be competent and proper survey should be made before awarding the prestigious national awards. Thanks for giving this alert to SNA. Now at least they will function with utmost care. Leela Samson-ji, kindly look into the matter professionally. Really very Interesting. As I am a layman and interested in Arts and dance, I happened to see the on going discussion and question and answers with precision. Indeed it helped me to know the depth of the art/ dance forms. I would like to appreciate Aditi Mangaldas for her answer in the last paragraph where she claims herself to be still a STUDENT OF LIFE AND DANCE. After reading this litany of dupatta defenses, I feel blessed to be watching dance OUTSIDE India. The dupatta has gone the way of the dodo, thankfully, in international Kathak dance centers. The readers can see photos of dupatta-free performances by such groups as Chitresh Das Dance Company, Kathak Arts center in NJ directed by Tanushree Sarkar, Sonia Sabri Company in the UK, and many more. Once you see Kathak performed without a dupatta, you will realize that far from enhancing, the dupatta has been disguising the line of the dancer's body all these years. Without dupatta one can appreciate the graceful yet steely spine of the Kathak dancer. One can also see clearly some of the interesting developments as far as back bends and diagonal incline of the body which are becoming part of the Kathak vocabulary. So from the point of view of an American practitioner of Indian classical dance, I say dupatta, begone!